The need for nickel for batteries is driving greater investment in mines in Indonesia. Batteries play vital role in modern society, powering everything from phones to EVs. Pacific Rim Cobalt Corp. (OTCQB: PCRCF, CSE: BOLT) has just released assay results confirming strong nickel, cobalt mineralization from its flagship Cyclops Project, strategically located in a well endowed nickel region of Indonesia. As the world’s leading source of nickel, Indonesia is seeing serious investments from multinational tech and mining corporations. Pacific Rim Cobalt Corporation (OTC: PCRCF) (CSE:BOLT) just announced assay results from its ongoing 2019 drilling campaign at the Cyclops, Nickel/Cobalt Project in Indonesia. VALE S.A. (NYSE: VALE) has also invested heavily in Indonesian nickel production. Glencore (OTC: GLNCY) both mines nickel and recycles it from old batteries. Lundin Mining Corporation (TSX: LUN) (OTC: LUNMF) produces nickel and its byproducts in four countries. Cobalt 27 Capital Corporation (TSX-V: KBLT) (OTC: CBLLF) has invested in a nickel mine in Papua New Guinea that, like Indonesia, offers good access to customers in Chinese industry. Batteries play a vital role in modern society, powering everything from torches and phones to electric cars. While the role of cobalt and lithium in these batteries is widely recognized, nickel is also critically important. The mineral features in a wide range of batteries, including the majority of electric cars. Nickel also plays an important part in steel production, which led to a surge in demand from China a decade and a half ago. At that time, production efforts increased to meet the demand; today, the growing importance of nickel in batteries is causing fresh pressure, along with a supply deficit. This increasing need for nickel has sparked more investments in nickel-producing regions — specifically Indonesia, the world’s largest nickel producer. The news from Pacific Rim comes as interest in electric vehicles — and demand for the batteries needed to power them — is gaining significant momentum. One of the most compelling reasons behind that increased demand is the desire for clean energy. As climate change disrupts weather patterns and destabilizes lives around the world, industrialized countries are starting to recognize that change as not just an environmental challenge but a security one. Those countries have responded by implementing clean-energy and clean-air policies, which are transforming the way that automobile companies work. More than 40 automakers are pivoting towards electric vehicles. While Tesla is grabbing most of the headlines, most recently by reducing the price on its Model 3 to make electric cars more widespread, more established car companies are also getting into the game. It took five years to sell the first million EVs but just six months to sell the last million. Hybrid cars are increasingly common, as are the charging points they need, and all but one of the major electric vehicle manufacturers use nickel in their batteries. This is creating the demand that Pacific Rim Cobalt Corp. is strategically working to address. As electric cars come to dominate the roads, the demand for the minerals used in them is set to soar. One of the companies making that kind of investment is Pacific Rim Cobalt Corp. (OTCQB:PCRCF) (CSE:BOLT), which has been been actively involved in a drilling project located on the northern shore of Indonesia, near China, which boasts the world’s largest electric vehicle battery market. On March 5th the company announced results from eight of the first fifteen holes drilled in the Yapase area of the Cyclops Project. The drilling confirmed the development of a complete mineralized laterite profile and is starting to confirm grades and widths that form the basis of the project’s historical estimate. Pacific Rim began a 50-hole core drilling program in mid-January on areas of laterite delineated by a geological mapping and a hand-augur geochemistry program. A total of 15 holes have been completed, covering a total of 255 meters, with hole depths ranging from 13 to 29 meters. Where possible, holes were drilled to fresh rock in order to intersect the full laterite profile. The world’s largest source of nickel production by nation is Indonesia. The country is rich with sources of the metal, many of which have yet to be effectively exploited. But this isn’t the only reason why Indonesia is a natural home for Pacific Rim’s Cyclops project. 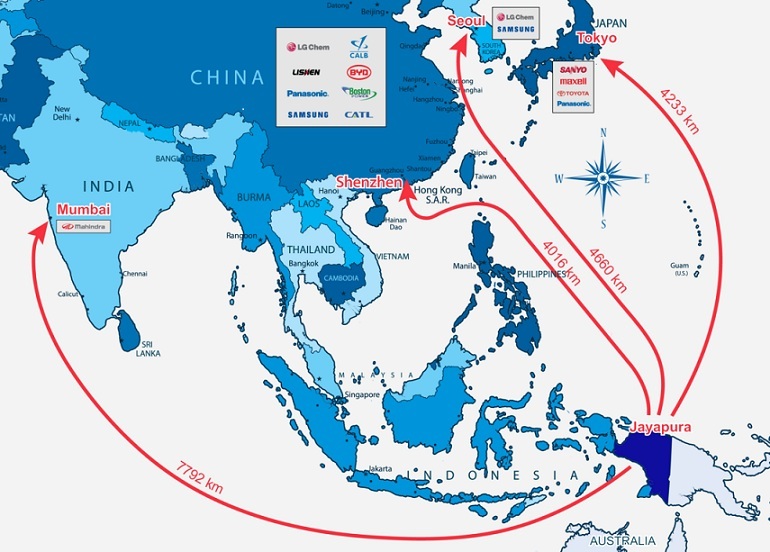 Located on the western rim of the Pacific, Indonesia is well positioned for exporting to China, the world’s largest consumer of battery metals. China has seen massive economic development in recent decades, thanks to the modernizing efforts of the country’s leaders. While modernization can be hard to balance with environmental protection, the Chinese leadership are well aware of the problems caused by environmental degradation, not the least of which is due to the heavy pollution in major Chinese cities. Those leaders are therefore encouraging clean alternatives, leading to a boom in electric car research and development. Investing in exports to China is a sound strategy for any company specializing in battery metals. The country not only produces batteries for its own use but also makes them for export, thus creating a fresh wave of demand for nickel in a country that drove a previous nickel boom just after the millennium. This boom is drawing more companies to Indonesia. By setting up a fresh nickel and cobalt mining operation within easy reach of China, Pacific Rim Cobalt Corp (OTCQB: PCRCF) (CSE: BOLT) is tapping into both supply and demand, ensuring an accessible market for its products. Pacific Rim has positioned itself as an early mover in the race for Indonesia battery metals. The company has gained 100 percent control of the 5,000 hectare nickel and cobalt Cyclops Project. With production and environmental permits secured, the project benefits from excellent infrastructure, including close proximity to an eager workforce and supplies, sealed roads, ocean access, nearby port facility and gentle topography. The existing road system also enables year-round access to the project and connections to key nearby cities, including Sentani and Jayapura. We suggesst you put PCRCF (OTCQX), BOLT (CSE) on your watchlist as the company aggressively advances it’s strategic nickel and cobalt asset in the Indonesian battery metals race. Nothing in this publication should be considered as personalized financial advice. We are not licensed under any securities laws to address your particular financial situation. No communication by our employees to you should be deemed as personalized financial advice. Please consult a licensed financial advisor before making any investment decision. This is a paid advertisement and is neither an offer nor recommendation to buy or sell any security. We hold no investment licenses and are thus neither licensed nor qualified to provide investment advice. The content in this report or email is not provided to any individual with a view toward their individual circumstances. MicrocapStockwire.com is a website owned by Mountain Capital Corp (“Mountain”). Mountain is receiving $2,500 plus an advertising budget on a month to month basis from Pacific Rim Cobalt Corp. to host and advertise this content. This compensation constitutes a conflict of interest as to our ability to remain objective in our communication regarding the profiled company. Because of this conflict, individuals are strongly encouraged to not use this newsletter as the basis for any investment decision. By reading this communication, you agree to the terms of this disclaimer, including, but not limited to: releasing Mountain Capital Corp, its affiliates, assigns and successors from any and all liability, damages, and injury from the information contained in this communication. You further warrant that you are solely responsible for any financial outcome that may come from your investment decisions. Subscribe To Receive Updates From Pacific Rim Cobalt Corp.
April 1: Pacific Rim Cobalt step-out drilling returns up to 1.21% nickel and 0.22% cobalt over 5 meters.